How has Judge Everingham applied the Exergen standard for pleading inequitable conduct? ■ That Judge Everingham has addressed seven motions challenging the sufficiency of inequitable conduct pleadings since the Exergen decision was issued. ■ In four instances Judge Everingham granted the motions resulting in a dismissal of the inequitable conduct claims. ■ In three instances the Judge denied or recommended denying the motions. ■ In most instances where the motion was granted, Judge Everingham found the pleading deficient with respect to Exergen‘s ”how,” and “why” requirements. Check out the short (2:56) video to see how! Or you can click here to view step-by-step instructions on how to perform this search. The court awarded plaintiff a royalty rate of 20% for defendant's infringement of its golf repair tool patent despite evidence that "most royalty rates are ten percent or less and that manufacturing companies with a gross profit between forty and fifty percent would warrant a royalty between six and eight percent." 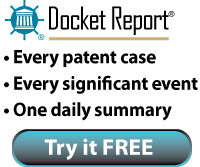 "96% of plaintiff’s overall sales were from the patented device thus making it an extremely valuable component of plaintiff’s business. . . . [I]t is highly unlikely that plaintiff would have issued a license to [defendant] to sell the infringing tools as [defendant] was a direct competitor with knowledge of plaintiff’s pricing structure and the ability to sell the product for a lower royalty amount. Further, the owner of [defendant] had been previously fired from plaintiff’s employ thus making a future business relationship unlikely. . . . If, however, the parties could have agreed to a willing licensor-licensee relationship after this course of events, the Court finds it reasonable to infer that a high royalty rate would be assessed. Accordingly, the Court concludes a royalty rate of 20% is appropriate here." The court denied the parties' joint motion to stay pending an ITC proceeding but sua sponte granted a stay pending further order of the court. "[T]he Court doubts the constitutionality of Section 1659(a)'s requirement that a district court 'shall stay' a case. Such provision appears to go beyond the legislative powers granted to Congress under Article I of the Constitution. See U.S. Const. art. 1, §§ 1,8; Hayburn's Case, 2 U.S. (2 Dall.) 408, 410 (1792) ('no decision of any court in the United States can, under any circumstances, in our opinion, agreeable to the constitution, be liable to a revision, or even a suspension, by the legislature itself, in whom no judicial power of any kind appears to be vested, but the important one relative to impeachments'). However, the Court does not so hold at this time. It is therefore ordered . . . that this action is stayed pending further order of this Court." Defendant's motion to dismiss plaintiffs' infringement action for lack of personal jurisdiction was granted where defendant discovered that a relative of one of plaintiff's employees was the purchaser of defendant's product in the forum. "Defendant argues Plaintiffs engaged in 'subterfuge' in an effort to create jurisdiction. Plaintiffs contend the purchase was not made to create jurisdiction but was for the purpose of establishing a solid factual basis for filing the Complaint through a physical examination of the accused device. Upon consideration, the Court finds that this one sale of the allegedly infringing product linking Defendant to South Carolina cannot form the basis for specific jurisdiction over Defendant because Defendant did not purposefully avail itself of the privilege of conducting activities in South Carolina. . . . Plaintiffs admit that they instigated the one sale of the allegedly infringing product that has reached South Carolina for the purpose of this litigation — to form a solid factual basis for the Complaint." The court invited defendants to participate in a pre-Markman hearing case dispositive claim construction process. "One of the Court’s goals is, as much as possible, to decrease litigation costs for the parties. To that end, and to sharpen the Court’s focus on the dispositive or most important issues, the Court will permit Defendant to submit, if desired, a request to construe no more than three 'case dispositive' claim terms in a letter brief. The letter brief shall explain the Defendant’s proposed constructions of the term(s) and why such a construction will dispose of the case. . . . Parties should note that there is no need for experts during this stage of the litigation. The goal here is to determine whether the case can be resolved without the need of extensive expert involvement. . . . After the briefing period has concluded, the Court will then hold an early Markman hearing on the identified case dispositive terms. If the case is not resolved following the Court’s claim construction summary judgment rulings, a Markman hearing, as set forth in the Docket Control Order or at the patent status conference, will occur as scheduled." Plaintiff's motion for an ongoing royalty following a jury award of a lump sum royalty was denied. "[T]he jury was not confused about the effect of its verdict in this case — the verdict clearly represents a lump sum award giving [defendant] a fully paid up license that covers all past and future use of the patented technology in [defendant's] products. The jury’s decision that an $8 million lump sum would adequately compensate for 'all . . . future sales of [defendant's] products,' in addition to past infringing sales, was, in effect, an advisory opinion with respect to prospective relief. . . . [T]he court accepts the jury’s finding. . . ."
The court granted defendant's motion for summary judgment as to plaintiff's claim for lost profits. "Even though [plaintiff] does not sell products directly to customers, it claims that it could have supplied [its] devices from the United States to other [plaintiff] entities for distribution in Europe, and thus should be able to recover the 'wholesale profits' it would have made under those circumstances. . . . [Plaintiff] has come up with a fictional supply chain wherein [the] products destined for Europe could have been manufactured in the United States and then artificially funneled through [plaintiff] for no other reason than to make its lost profits claim. . . . [T]here is no evidence to suggest that the hypothetical supply chain has ever been used. The unrebutted evidence shows that 'but for' the alleged infringement, [plaintiff's] European distribution chain would have made the lost sales, not [plaintiff]." The court denied defendant's motion for summary judgment of invalidity under 35 U.S.C. 112 ¶ 4. "[Defendant] has not cited any Federal Circuit case law in which the court invalidated a dependent claim under § 112 ¶ 4 because the dependent claim recited only structural limitations on the independent method claim. To the contrary, Federal Circuit authority indicates that such dependent claiming is permissible. . . . [T]he court finds that [defendant's] argument that [certain claims] are invalid under § 112 ¶ 4 because they only add structural limitations to a method claim lacks merit." In denying defendants' motion for judgment as a matter of law on damages, the court upheld the jury's acceptance of plaintiff's "two-tiered" reasonable royalty analysis. "[T]he fact that Tier 1 royalties would exceed Defendants' actual world selling prices in some cases does not mandate a finding that the jury's verdict lacked evidentiary support. As explained above, in a world in which [plaintiff] would be the sole supplier, the but-for pricing would be higher because customers would be willing to pay a price consistent with the benefits of the technology. . . . [T]here was sufficient evidence for the jury to conclude that customers and Defendants would have accepted the price increases in a world without infringement, given the evidence related to the historical pricing and the value of the technology." The magistrate judge recommended denying in part defendant's motion to dismiss and rejected defendant's argument that "the court should dismiss all of the claims of the patents-in-suit because [plaintiff] admitted that the claims it asserted in [an earlier case] were 'representative.'. . . [T]here could have been no final decision on the validity of claims that were withdrawn, not asserted, or never litigated in [the] first case -- that is, there could have been no final decision on 'the identical question' of the validity of claims that were not presented to the jury in the first case." The court granted defendant's motion for summary judgment that its patent for a method for detecting fetal Down syndrome was not invalid for lack of patentable subject matter. "The Court concludes that the claimed step is sufficiently 'tied' to an ultrasound device to pass muster under the machine-or-transformation test, regardless of whether 'measuring' an ultrasound scan requires a machine. Because an ultrasound scan (presumably taken by an ultrasound device) is required to perform the method, this step 'is tailored narrowly enough to encompass only a particular application of a fundamental principle rather than to pre-empt the principle itself,' fulfilling the purpose of the test." The magistrate judge recommended granting plaintiffs' motion for terminating sanctions. "[O]ne reasonably would expect [defendants] to promptly notify plaintiffs and/or the court of the alleged four day long equipment failure and damage to the server, particularly in light of [the court's] express warning that the court would consider any manipulation of the data in any way, shape or form, not only a civilly punishable matter, but a criminally contemptible matter that would amount to obstruction of justice. Yet, [defendants] did not mention the alleged corrupting event when it occurred . . . nor [in subsequent communications with plaintiffs or the judge]. The first mention of such an event came . . . over a year after the power failure allegedly occurred. . . . [T]he court finds that the [defendants’] efforts to blame its corrupted server on a coincidental and sudden power failure . . . are unsupported by credible evidence. The court further finds that [defendants] took some deliberate action . . . to intentionally corrupt the server at issue in willful defiance of this court’s orders." The American Bar Association (ABA) is working on their annual list of the 100 best legal blogs, and would like your advice on which blawgs you think should be included. Check out our blog roll for some great blawgs to submit! The magistrate judge recommended more than $1.2 million in contempt sanctions to reflect double damages for defendant's violation of a permanent injunction. "The language of the injunction is clear, and the injunction has yet to be modified by either this court or the Federal Circuit. Defendant argued for an injunction which did not reach offers to sell overseas, but the court did not adopt its position. Defendant then chose to disregard the plain text of the injunction and communicate with [a third party]. A month into those negotiations, defendant sought clarification and modification of the injunction in this court – yet proceeded to consummate [two third party] transactions without waiting for the court to rule on its motion. The court also recommends an award of attorney’s fees and costs." Plaintiff's motion to compel the deposition of defendant's systems architect was granted. "[N]one of [the cases cited by the parties concerning the timing of pinpoint infringement contentions following production of source code], and in fact, no case which the Court has found, per se restricts a party’s ability to take a deposition of a software writer contingent upon its providing pinpoint source code contentions. It might be assumed, from these cases, that the burden is entirely upon a party’s own experts to examine source code and to then come up with specific or pinpoint infringement contentions. If that is the case, at least in the view of this Court, it may be too general of a conclusion, and one which does not allow for specific facts in specific cases to be evaluated. . . . [W]hat is the harm if the deposition proceeds? [Defendant] has already produced its source code. [Plaintiff] has identified its infringement contentions; it has refined them; and it indicates it requires this discovery to determine if its contentions can be set out in an even more pinpoint fashion. There is no contention here that [plaintiff] would use a deposition pertaining to [defendant's] source code to develop information not relevant to this lawsuit, within the meaning of Rule 26. Additionally, this Court should not be put in the position of micromanaging a deposition, as [defendant] seems to request, to limit it specifically to those pinpoint infringement contentions identified by [plaintiff]." Following the court's dismissal of plaintiff's qui tam false marking action, the court granted in part defendant's motion for costs. "[Plaintiff] argues it should not have to pay any costs because it was acting in the public interest by bringing the lawsuit as a qui tam relator to help the United States enforce the false marking statute; and if anything, it should only be required to pay half of any allowable costs. However, [plaintiff] did not provide -- and the Court cannot find -- any precedent holding that qui tam relators are immune from costs." The court granted plaintiff's renewed motion to strike defendant's answer and enter default for failing to comply with court orders after defense counsel's fraudulent claim that he had emailed plaintiff's counsel regarding discovery. "[T]he Court is now convinced that the email was fraudulent. This is particularly evident from the information provided by [the host of defense counsel's email account] that the email was never sent by [defense counsel]. . . . The Court does not have sufficient evidence to determine whether or not [defendant] knew about and/or supported [defense counsel's] efforts to forge the email. Nevertheless, because the Court now knows the email was fraudulent . . . the Court can conclude that [defendant] willfully violated the Court's Discovery Order." Following summary judgment of invalidity, the court granted defendants' motion for attorneys' fees and costs of over $800,000 due to plaintiff's failure to produce documents showing the patent-in-suit was invalid. The court rejected plaintiff's argument that attorneys' fees should be awarded only for plaintiff's efforts in obtaining the previously withheld documents and instead awarded fees for all litigation activity from the date the documents should have been produced to final judgment. "Plaintiff contends that Defendants should only be awarded fees related to their trip to Utah to conduct discovery, totaling $17,149.00. According to Plaintiff's logic, the only fees incurred as a result of its failure to produce documents fatal to its claim were those related to Defendant's travel to Utah to look for the documents themselves. . . . Plaintiff continues to misunderstand the severity of its misconduct. . . . Throughout the duration of the suit, Plaintiff had in its possession documents which ultimately invalidated the patent it was alleging to be infringed. Plaintiff has yet to produce these documents; Defendants were only able to discover them through a combination of extreme diligence and good fortune. The duration of this lawsuit would have been significantly shorter had Plaintiff turned over the pertinent douments when it was ordered to do so. . . . Plaintiff's misconduct directly caused Defendants to incur hundreds of thousands of dollars in ultimately unnecessary fees." The court granted plaintiff's motion for summary judgment on defendant's unclean hands defense. "[Defendant] has shown neither a 'direct nexus' between stock options backdating and prosecution of the relevant patents, nor that any stock option backdating 'materially prejudiced' [defendant's] ability to defend itself. Even assuming all of [defendant's] allegations regarding stock options backdating are true, [it] fails to link the propriety of [plaintiff's] employee compensation and accounting practices to acquisition of the patents in suit. . . . Were the Court to accept [defendant's] theory, the direct nexus requirement would be obliterated. In its place would be a test where the defense of unclean hands is available in a patent case whenever a corporation dirties its hands through accounting practices, pays its employees with the 'proceeds' of those practices, and simultaneously happens to be prosecuting new patents." In ruling on defendant's motion to dismiss plaintiff's indirect infringement claims, the court found that Twombly and Iqbal, not Form 18, controlled. "Since [Bell Atl. Corp. v. Twombly, 550 U.S. 544 (2007)] and [Ashcroft v. Iqbal, 129 S. Ct. 1937 (2009)], the district courts have been split on the appropriate standard to apply when deciding whether a complaint alleging induced infringement or contributory infringement (i.e. indirect infringement) survives a Rule 12(b)(6) motion to dismiss. . . . [T]he court agrees with the cases requiring that indirect infringement claims satisfy the pleading standards announced in Twombly and Iqbal. . . . Form 18 appears to apply only to direct infringement claims, and the Federal Rules of Civil Procedure do not provide an analogous form for indirect infringement claims." In calculating an ongoing royalty rate, the court determined that litigation-related licenses were more reliable than non-litigation-related licenses. "[I]n light of the small volumes at issue for the non-litigation licensees, the cost of potential future litigation may thus have actually played a more significant role in the non-litigation-related licenses than in the litigation-related licenses. At a minimum, the low volumes at stake in the non-litigation-related licenses render them less reliable than the litigation-related licenses entered into with banks." The court denied in part plaintiff's motion to dismiss defendant's invalidity counterclaims for failure to state a claim. "No federal court of appeals has considered how the [Bell Atlantic Corporation v. Twombly, 550 U.S. 554 (2007)] and [Ashcroft v. Iqbal, 129 S. Ct. 1937 (2009)] decisions apply to patent invalidity counterclaim or affirmative defense pleadings. District courts, including those in this circuit, have reached conflicting results. . . . The Court holds that invalidity counterclaims and affirmative defenses that allege only their statutory bases are adequate to survive a Rule 12 motion challenging the sufficiency of the pleadings. Such pleadings conform with Rule 8 of the Federal Rules of Civil Procedure by giving the defendant fair notice of what the claim is and the grounds upon which it rests. Because the pleadings also meet the standard set out in the Federal Rules of Civil Procedure for pleading patent infringement claims, it would be inequitable to hold that they are nonetheless insufficient to state an invalidity counterclaim. "For reasons that are irrelevant to this order and not subject to input from counsel, the Honorable Barbara B. Crabb, District Judge, has changed her procedures for construing claims and deciding summary judgment motions in patent lawsuits. . . . The court will not hold a stand-alone claims construction hearing and shall not issue an order construing claims. Instead, if any party wants the court to construe a claim, it must make that request and offer its proposed construction in its motion for summary judgment and supporting documents. . . . The sixteen-claim limit on construction no longer applies because the court expects that its new combined procedure will result in more tightly focused construction requests." Plaintiff's expedited motion to compel the production of documents regarding sales evaluations of accused products was granted as the information was relevant to the question of lost profits from price erosion. "I do not agree with [defendant]’s argument that only [plaintiff's] prices are relevant to a calculation of price erosion. If [defendant]'s sales evaluation files show that [defendant] engaged in vigorous price competition with [plaintiff], such that [plaintiff] was forced to lower its prices relative to [defendant]'s prices, the sales evaluation files are relevant to a calculation of price erosion. To determine whether there is 'vigorous price competition' between two companies a court must necessarily analyze the prices set by both companies and their respective market shares. . . . For this reason the prices set by both [plaintiff] and [defendant] for training pants are relevant to price erosion."